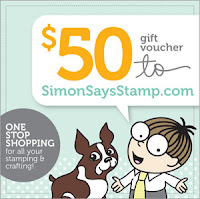 I'd like to thank Simon Says Stamp for another great chance to win a $50 voucher - as well as a big thank you to everyone who joins in our challenges!! Thank you for choosing my project! So proud and happy. Congrats to all the other girls!!! oh my goodness, thanks so much I am honored!